“It was a hard start, Great Britain put out a real run in the second quarter and got the crowd behind them. They got a lot of shots through. We could not get too much going through. We came out great in the third quarter – I thought we took the crowd out a little bit,” said Anderson. Canada also benefitted from the strong play of David Eng (Montreal, QC) and Richard Peter, (Vancouver, BC) who had 13 points and 12 points respectively. “They missed a lot of shots in the beginning that were wide open and that usually they don’t miss. It’s also tough playing at home in front of a big crowd. But then that’s double-edged, right? They did come back at us, got closer to us and you have such great fans here that I think the crowd helped with that. They (Great Britain) are not done yet, you know. We still expect to see them win some games and we might see them again later on in the finals,” said Eng. Gaz Choudhry was the only British player to reach double digit scoring with 11 points. 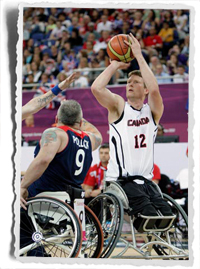 As a team Canada faired well from the free-throw line going 13/19 (68%) compared to the Brits 45% accuracy. They also out-muscled their opponents in the paint outrebounding them 42 to 30, which led to 8 additional second chance points. Next up, the Canadian Men will face Poland Saturday September 1st, at 9:15pm BST. The Canadian Women’s Wheelchair Basketball Team opened the London 2012 Paralympic Games with a 70-59 loss to the Netherlands. Canada fell behind early and was never able to establish a lead. The Dutch went on an 18 point run in the first half and led by as much as 15 points at the break. Canada fought back and managed to cut the lead to 7 points by halftime (34-27), but had trouble containing Mariska Beijer. She scored 21 points in the first two frames, and finished with a game high 34 points and 14 rebounds. 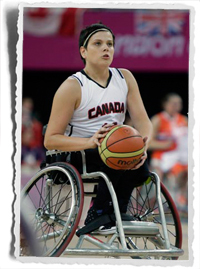 Canada countered with Janet McLachlan, of Vancouver, BC, who scored a personal best 26 points and 15 rebounds (the highest known single game point total recorded by a female Canadian at the Paralympics). “Other than our first quarter, we did a pretty good job. We have a lot of new people on the team and this was a new atmosphere for us and maybe that showed in the first quarter. In the second, third and fourth quarters we did a much better job,” said McLachlan. Katie Harnock, of Elmira, Ontario, also reached double digits in scoring and rebounding with 13 points and 10 assists. Both her and McLachlan paced Canada with 5 assists each. “It’s early days yet, it’s just the first game. We have tons of time and I think we showed at the end that we’re definitely in the conversation. We’re a very good team and I think the sluggish start is what really cost us today but we’ll look at the film, we’ll look at things and we’ll definitely be ready for the next game,” said Harnock. The Dutch were able to capitalize on the momentum they gained from their first game, a lopsided victory over Great Britain (62-35), and improve to 2-0 in the tournament. Canada’s record sits at 0-1. Next up, the Canadian Women will face Australia Saturday September 1st at 6:30pm BST.